Last week, the hashtag #MaybeHeDoesntHitYou sparked conversations about emotional and psychological abuse. This week, #MyDepressionLooksLike encourages everyone to look past our preconceived notions about depression. Most people picture a depressed person as someone who is always sad, but sadness is only a small part of it. 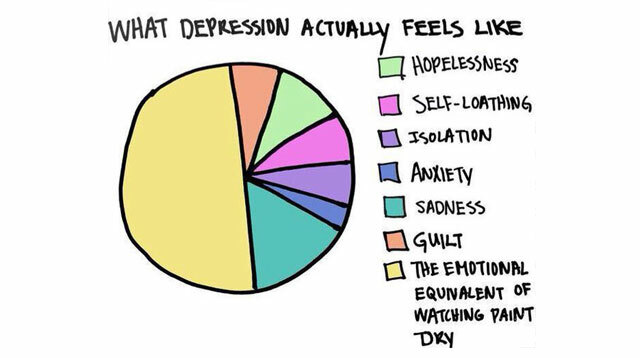 In fact, some depressed individuals may not even feel sadness. According to the National Institute of Mental Health, you may be depressed if you’ve been experiencing these symptoms for more than 2 weeks: persistent anxious or empty mood, feelings of hopelessness, guilt, and worthlessness, loss of interest in hobbies, decreased energy, difficulty concentrating/making decisions/sleeping/remembering, change in appetite, thoughts of suicide. #MyDepressionLooksLike exhaustion that makes me view my bed as a solace and a prison at the same time. #MyDepressionLooksLike wishing everyone would leave me alone and at the same time, wishing someone would see me struggling. #MyDepressionLooksLike getting a full night of sleep yet waking up and still feeling tired. Help spread awareness by sharing this with your friends.